The first bridge to span the River Torridge at Bideford was built in oak in the early 14th century. Over the centuries the bridge was widened several times to cope with increased traffic, and the structure strengthened with the advent of new building materials. Measuring 677 feet and consisting of 24 arches, it is one of the longest span bridges in the country. 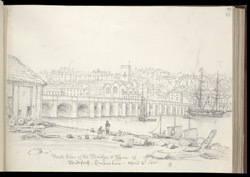 From the 16th to the 18th century, Bideford was one of the busiest ports in the country. Cargo ships, laden with newly discovered commodities such as tobacco and coffee, landed here after long and often dangerous voyages over the Atlantic from the Americas.